عرض السلة “طقم أدوات المائدة الفخمة الأنيقة ، طقم من 24 قطعة من الستانلس ستيل المقاوم للصدأ العالية الجودة لعدد 6 أشخاص” تم إضافته إلى سلة مشترياتك. 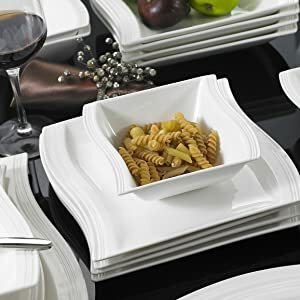 The porcelain dinnerware set is BPA free and FDA certificated, there’s no need to worry about BPA seeping into food like with some plastic dishes and containers. 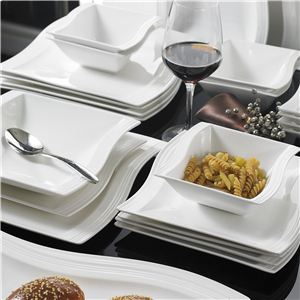 The porcelain dinnerware set can be safely used in the freezer, microwave, and oven. The dinnerware set can withstand a maximum temperature of 572 degrees (Fahrenheit) . What’s more, the Malacasa dinnerware set with softer shapes and a flowing modern look can go in the dishwasher, making cleanup a snap. Spend more time with family and friends and less time cleaning up with dishwasher and microwave safe construction. The Dinnerware set includes six 10.25-in. dinner plates, six 8.25-in Dessert Plates, six 8.5-in Soup Plates, six 5.75-in. bowls, one 11″ Rectangular Plate and a 13.25″ Rectangular Plate, giving you and your family enough containers for a main course and all the side dishes.